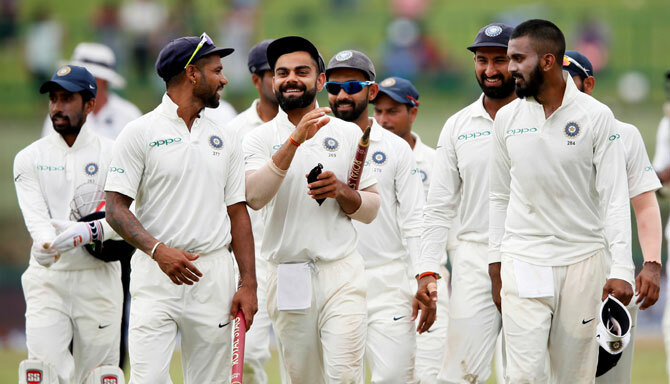 India's first ever overseas whitewash came against a below-par Sri Lanka side in a lopsided series but skipper Virat Kohli doesn't want to read into where the game's longest format is heading. "We are winning and the momentum is with the team. When playing, we don't think ‘where Test cricket is headed and what the future will be’. We consider it a privilege that we are able to play Test cricket for the country. Our mindset hasn't changed one bit till now," the skipper said after the match. Kohli did agree that when both teams compete on even keel, the situation becomes better. "When both teams play very good cricket, it is a cracker of a series. But like South Africa were in England for four months, that factor they themselves admitted that it played on their minds because they didn't go home after the Champions Trophy. I think all those factors too should be taken into account. "If any team plays very well in a series, you will get such results. When both teams play with equal intensity, the matches will be very close and so will the series," he added. The Indian skipper has often attributed this consistency to concentrating on getting the team's process right. He also added that bench strength has been a marker in the side's progress over the last couple of years. "In the last game, we enforced the follow on but we did not execute the things that we wanted to the best of our abilities. Plus the opposition played well. This time we took it as an opportunity. We spoke about it in the morning -- treat this as Day 5 of an away tour, probably a series defining Test match where we'll have to get an opposition out within 60-70 overs. "So we keep finding different situations and scenarios where we can challenge ourselves as a team first before we look at the opposition. Again today was another opportunity for us to challenge ourselves and I'm glad the way the guys stood up for it," said Kohli.